Once touted as the Next Big Thing, the English band have done even better and become their own thing. Have the Vaccines really survived being labeled as the Great White Hope of British rock by the British rock press? Such a mixed blessing certainly has sunk a hundred other bands. Yet here the quartet are, intact after four years and three albums, sounding more confident than ever. How did they do it? The basic explanation is really quite simple. With their sophomore album, Come of Age (2012), the Vaccines established they wanted nothing more than to be a pop-rock band. With the excellent "Melody Calling" single in 2013 and now English Graffiti, they have set their sights on being a great pop-rock band. Gone are any last vestiges of the neo-post-punk noise and angst that marked their debut, What Did You Expect from the Vaccines. Those hoping for a "return to form" in that mold will be sorely disappointed. Yet the Vaccines should get credit for having the foresight to realize that sound was ultimately a stylistic dead-end, and their moodiness and punky songwriting flair could still come through without all the reverb and portent. If the Ethan Johns-produced Come of Age stripped back the Vaccines' songs to their raw essence, in doing so it also revealed a band that still hadn't quite settled on its own vibe. For English Graffiti, the band brought in Dave Fridmann, best known for his work with the Flaming Lips and Mercury Rev, and Beck and Ariel Pink associate Cole M. Greif-Neill to add a more contemporary feel. The two producers help the Vaccines thicken their sound with layers of effects, bursts of noise, and psychedelic flourishes. At first, the outsize production threatens to overwhelm the music. One does not hear instruments so much as a mass of sound. Give the album some time, though, and the songs win out. Fridmann's and Greif-Neill's magic is in thickening the sound while paradoxically making it more expansive. The result is the Vaccines' most varied, fun, and interesting album to date. The rhythm section is still punchy, and Justin Young's awkwardness as a frontman still works in unison with his self-berating lyrics. The hyperkinetic, headrush power pop songs are still in play, no more so than on lead single "Handsome". But there is a new depth to even these would-be throwaway moments. The verses of "20/20" settle on a sing-song, almost chirpy melody highly reminiscent of the Jam, before Freddie Cowan's buzzing power chords kick in for a thrilling chorus. "Radio Bikini" nearly goes completely off the rails, but it's more Buzzcocks than Strokes. What's unexpected and great about English Graffiti, though, is such rollicking moments are actually not the highlights of the album. 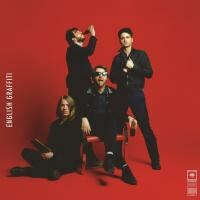 Rather, the Vaccines really hit their stride on the handful of more ponderous, midtempo numbers that show just how far they've come as songwriters and arrangers. "Dream Lover" is loosely reminiscent of the Romantics' '80s moodpiece "Talking in Your Sleep", but winks at itself with a big, dumb riff from Cowan. "(All Afternoon) In Love" rides on a gentle, Lennon-inspired piano rhythm, while the gorgeous "Want You So Bad" may be the band's most accomplished track yet. Using a mildly funky, genuinely slinky groove as a launching point for Cowan's shimmering, effects-heavy chords and urgent leads, the track ends up somewhere in near earth orbit, inhabiting a sonic space only hinted at on the previous album's "Lonely World". "Maybe I Could Hold You" comes close to attaining the same level of sonic bliss. Passing off English Graffiti as merely the Vaccines' "dreampop album" would be a mistake. For one thing, it would fail to account for the livelier numbers, or the glam/goth drama of "Denial". These songs are far too catchy for such a tag, anyway. Not all of English Graffiti's sonic experiments take. For one, it would be nice if the drums didn't sound as if they had been rapid-fired out of a malfunctioning taser gun. Far more often, though, in spite of its breadth or maybe because of it, the album sounds like the Vaccines' most natural yet. They just might be elder statesmen in the making.